Jas told me he wanted me to take these turtlenecks right back to where they came from. I told him I wanted to wear them to every Christmas party we go to this year. So he settled for a good, old fashioned, family Christmas photo instead. They have posted boy scouts at the doors of almost every grocery store within a 10 mile radius to sell mistletoe and holiday cheer to all shoppers... I successfully avoided eye contact at all of my stops until I came out of Albies and saw the little guy with the freckles and the boy-scout shirt that was sort of too small. I have a problem with the word "no". Or even the combo "no thanks". Oh well, at least that meant Jas got a little mistletoe action. Win-win really. Those turtlenecks are hilariously horrible! You should wear them to the Furness fam Christmas party this year. Who knows...Rex might even be convinced to wear that awful dicky of his again. Becca! I knew you would be proud of my purchases. Even told Jas that you would love us if we wore them to the Furness fam party. He said only if Rex wears his dicky. p.s. $5.97 at Wallys. there was a white one with wreaths with your name on it. You two are soooo cute! I love it! baaahh! love those turtlenecks! tell jason HE should go back to where HE came from! I say keep them. I really like the mistle toe that you got from the freckly little scouter, too. Ahhhhhh Jason's t-neck is awful but I can't stop laughing! You guys are so awesome! I saw a sweater at WalMart the other day that your turtleneck would look awesome under. If it goes on sale for 1/2 off, which it probably will, I might just pick it up for you. Merry Mistletoe. xoxo the egg out west. LOVE THOSE!!! hahahahahaha...he's a good sport! There's no way Jake would've done that for me! This is adorable! 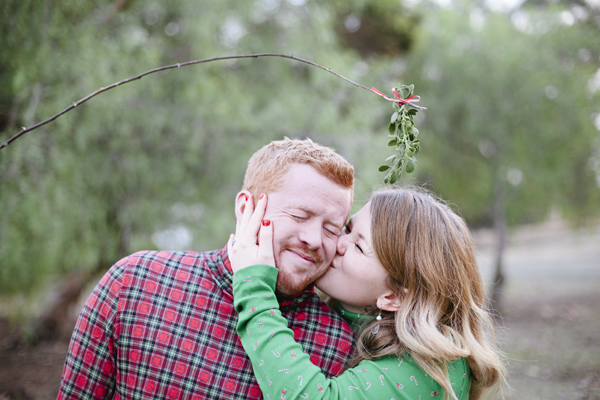 I never thought of using mistletoe for Christmas pictures. LOVE it. Haaa I am with Jason. When I first saw the pics I thought ah hell... Jason has really gone a little south with his taste! Then I was like oh Phewwww Geri made him wear it! I hope you gave him a solid kiss for wearing that snuggie/turtle neck/sweatshirty thing! Woulda laughed a titch harder had it been a mock tneck! See ya in a few! You two are so stinkin' cute! Hope you're enjoying your fam in Idaho, maybe we'll run into each other while you're here! Miss ya! 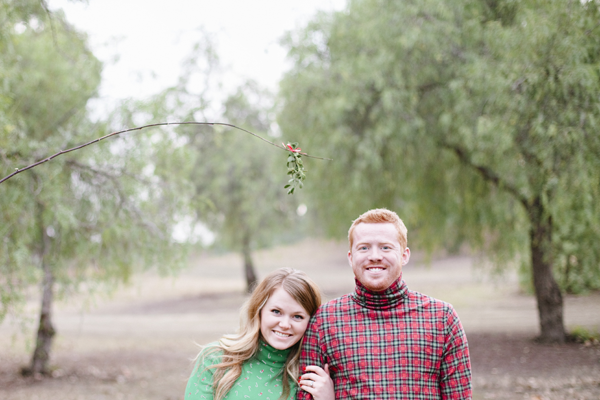 Those are the cutest Christmas photos ever, turtlenecks included!